Buddy it is some kinda hot up here! But I'm not complaining because, well, it is NOT snowing sideways. I've vowed never to whine about the excess of heat. 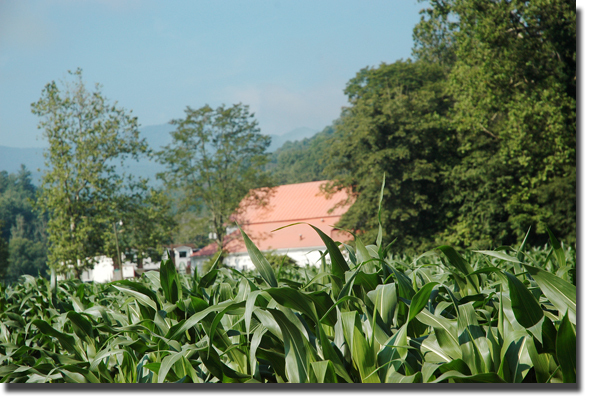 Besides, heat makes the corn grow in the field behind the Mast Store Annex. And, it makes Scott's squash and turnip greens happy which in turns makes me happy because he shares his bounty with me. Scott's new book The Farm is out and as soon as I got it home, my husband stole it to read. Btw, I took the his publicity shot you see can see on the above link. Oh, and there is more excitement on this hillbilly's horizon! I'm meeting my first blogger face to face tomorrow. If I don't post anything tomorrow, it will be all Jane's fault. She is coming to Boone plum 'cross the hollow from Hillbilly, Please to meet lil ol me.